In August, 2017, the Court had already ruled that a São Paulo ban asbestos law was valid and comments by Ministers upheld the constitutional value of health4 and the constitutional precepts of protection of life, human health and the environment.5 Numerous delays and legal manoeuvrings resulted in the disposition of two lawsuits filed by the pro-asbestos National Confederation of Industry Workers against the Rio de Janeiro asbestos ban being deferred for a further three months. In the intervening weeks, much had changed with continuing pressure being exerted on asbestos companies by lawsuits on behalf of injured workers and the imposition of substantial sanctions and financial penalties. News of discussions regarding civil actions on behalf of asbestos-exposed workers and family members in the states of Bahia, São Paulo and Paraná6 made manifest the increasing mobilization of asbestos victims and their families; the bad old days when the asbestos-injured were part of an invisible epidemic were long gone. Judgments such as those handed down in October in Vitória da Conquista, Bahia awarding medical costs and lifetime pensions to former employees of the asbestos mining company Sama Minera Associadas7 and in November by the Rio de Janerio Regional Labor Court increasing collective moral damages owed to former Eternit workers from R$30 million to R$50m (US$15.3m)8 highlighted the impossibility of the asbestos industry continuing business as usual. Perhaps hoping to buy just a little bit more time, on November 28, 2017  the day before the Supreme Court decision  Eternit announced it would be phasing out the use of chrysotile asbestos in its production of cement roofing tiles by the end of next year (2018). This last-ditch ploy was unsuccessful and it is likely that it will be in a matter of weeks not months that the company will have to transition its production to safer technologies. The Supreme Courts decision is a testament to the decades of hard work by asbestos victims, trade unionists, campaigners, medical and legal experts who have worked so assiduously to expose the lies and dirty tricks of the asbestos industry. Commenting on the implications of this verdict Brazilian engineer Fernanda Giannasi, who was been at the forefront of the campaign to ban asbestos in Brazil for 30 years and is a leading light of the global ban asbestos movement, said: If an asbestos producer country like Brazil is able to make such a decision, why wouldnt consumer countries do the same? Why indeed! 1 STF proíbe amianto no Brasil [Supreme Court prohibits asbestos in Brazil]. Decisão definitiva do Supremo proíbe amianto crisotila no Brasil [Supreme court ruling prohibits chrysotile asbestos in Brazil. November 30, 2017]. 2 President of the court Minister Cármen Lúcia, Ministers Rosa Weber, Edson Fachin, Luiz Fux, Dias Toffoli, Gilmar Mendes and Celso de Mello were in favour of the verdict; the two dissenting Ministers were Alexandre de Moraes and Marco Aurélio. 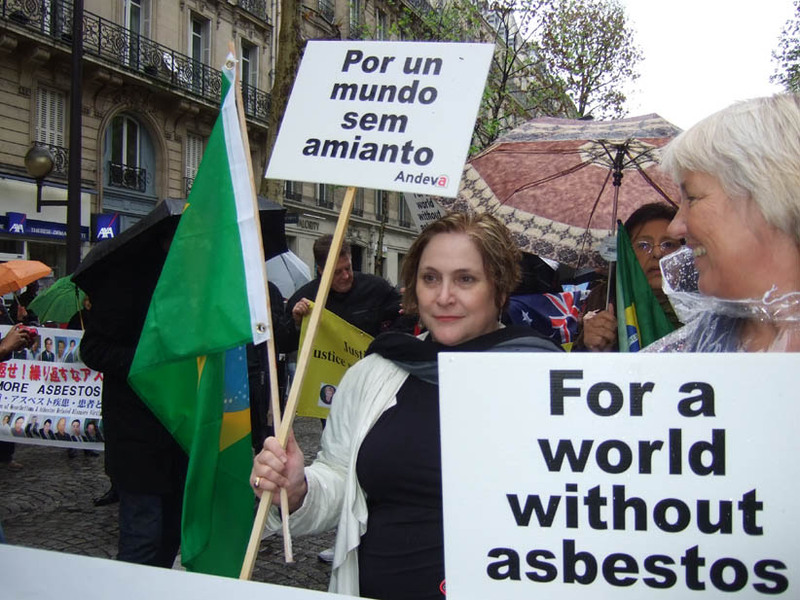 3 Brazilian Supreme Court Bans Use of Asbestos in Brazil. November 30, 2017. 4 Kazan-Allen L. Brazils Asbestos Divide. August 28, 2017. 5 Supremo proíbe produção e venda do amianto no Brasil [Supreme Court prohibits production and sale of asbestos in Brazil]. November 29, 2017. 6 Audincia Pública hoje em Bom Jesus da Serra/Bahia com familiares e ex-empregados, vitimados pelo amianto na antiga mineração fechada [Public hearing today in Bom Jesus da Serra / Bahia with relatives and former employees, victims of asbestos from closed mine.] November 18, 2017. Ex-trabalhadores de Londrina vão cobrar indenizaçes por Amianto [Former workers in Londrina to collect asbestos indemnities]. November 10, 2017. ACP contra Brasilit pede indenização a 2 mil ex-empregados contaminados por Amianto [ACP v Brasilit seeks compensation for former 2,000 asbestos-exposed employees]. 7 MPF de Vitória da Conquista pede pagamento de indenização a vítimas de amianto da Sama [MPF of Vitoria da Conquista orders compensation payments to Samas asbestos victims]. October 4, 2017. 8 Eternit terá que pagar R$ 50 milhes por expor trabalhadores ao Amianto. [Eternit will have to pay R$50 million for exposing workers to Asbestos].November 28, 2017.